Hunter celebrated the official opening of its first global flagship store at 83 Regent Street in London. 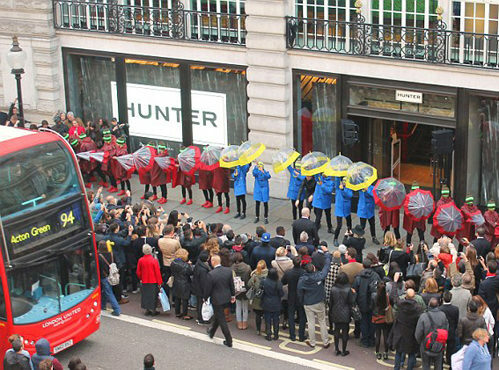 For their take on the traditional store opening, Hunters arranged for dancers to take over the iconic London street with a production of wellington-wearing dancers inspired by Singin’ In The Rain and Hunter’s heritage of protection from the weather. The creative agency behind the event, My Beautiful City, had teamed up with award-winning choreographer Supple Nam. The event involved a flash mob made up of 40 dancers who appeared from a Double Decker Bus. They completed a short routine which culminated in our Rain Effects, showcasing the quality of Hunters products. We were bought in to provide a Rain Effect, which provided several challenges mainly driven by the location in Regent Street on a busy morning with members of the public passing in their thousands. Luckily there was a small side alley next to the shop which was not a main thoroughfare. We had to bring in a large IBC Water Bowser to be our water source. Power was the next issue, we had to run a supply from the shop but conceal the cables for the aesthetics of the production as well as eliminating any trip hazards with the large number of passers by. We waited in the side street out of site, waiting for the production of the marketing stunt to commence. A double decker bus stopped outside the store, the dancers jumped off, the music started and they performed in front of the shop. As the act came to an end, we sprung from the side street. We had made bespoke spray heads on long hoses enabling us to reach the street from our side alley. We fired up the pump and covered the performers with a light spray of rain and they lifted their umbrellas to provide instant shelter from the elements.